This year the PTA bought the technology department two 3D printers. Kari and I had attended the annual CUE Conference and had gotten very inspired and excited by the printers we saw. Because we already teach a CAD (computer aided drafting) class in our magnet program, we thought it would be the perfect fit. Neither of us had ANY experience with 3D printers or the curriculum that could go with them. I teach in a dedicated lab and my subject is Computer Science and Graphics. I wanted to implement a unit that incorporated 3D printing and had some great engineering standards incorporated. I found it challenging to find lesson plans on the web. 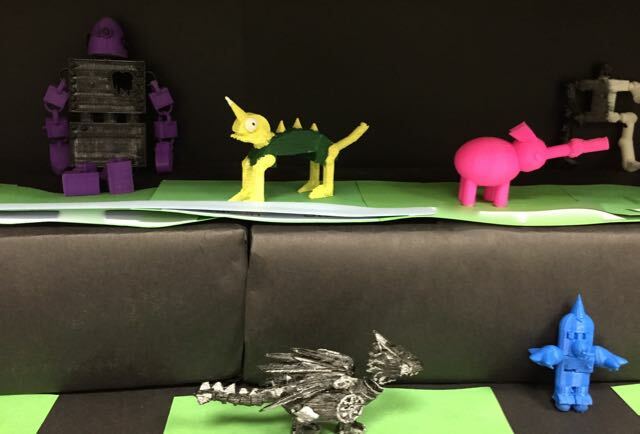 There are some great 3D printing resources, but most of the lessons focused on HOW to use the printers or printing items for a science or social studies class. Other units I found were focused on a makerspace environment, which is very different than my five classes of 39 kids. I decided for my first unit, to keep it simple. Because BrainPop has a great mini lesson on 3D printed robots, I decided to dive off from there. After doing the BrainPop activities and printing a Moby for the class, we go busy creating our own robots. The students started by researching robots. They found pictures and articles on robotics and what robots are used for the real world. They chose two pictures of robots and interacted and shared with peers about what they liked in particular about the robots they chose. They identified specialized parts that do a task and why some shapes and configurations are better than others for different tasks. 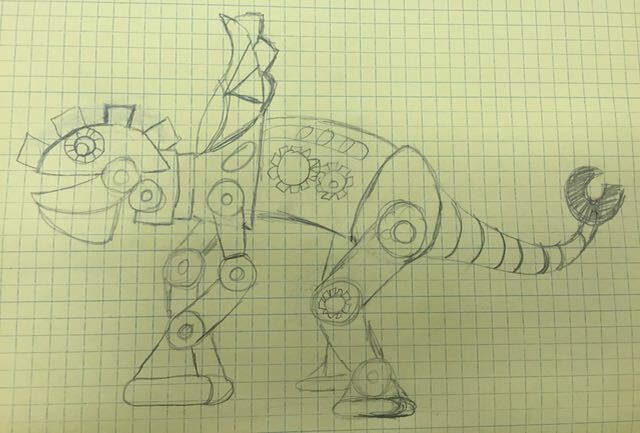 The next step was for each student to draw his or her “dream” robot on graph paper. We talked about the limitations of 3D printing, emphasizing how easy it is for tiny parts to snap off or not print well. My students’ robot design had to have a specialized task. 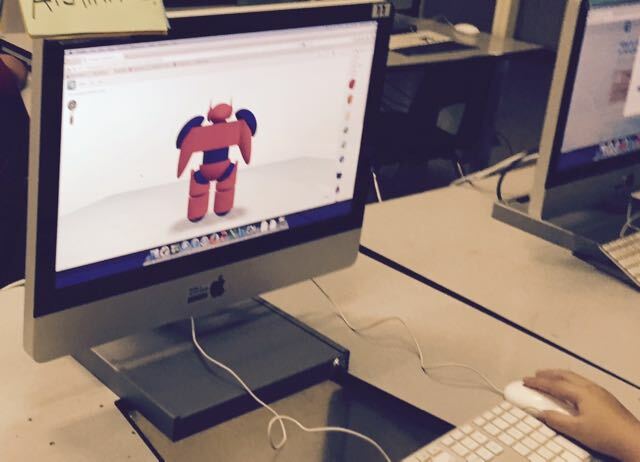 The students then designed their robot in TinkerCAD. TinkerCAD is a free 3D modeling site from Autodesk. It is really great for kids of all ages. It has 3D shapes that students can combine to create 3D objects. The BEST thing about TinkerCAD is that it comes with a great series of tutorials that teach the students the program at their own pace. Prior to this entire lesson, my students spent a few days with TinkerCAD just completing the tutorials. 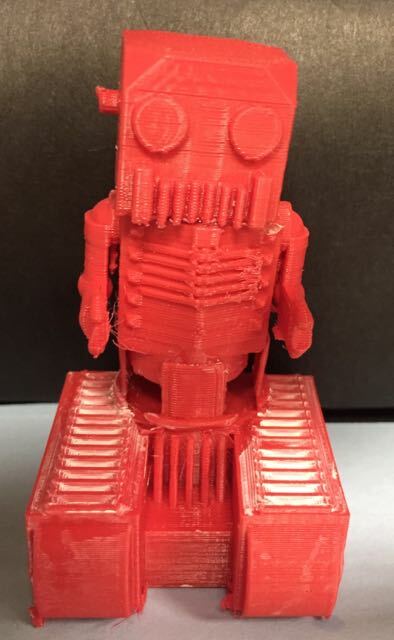 The students turned in the .stl files and their robot was printed for them. I use aides to help me with the printing. Each print can take several hours so I would try to scaled down the robots an print at least three at a time. I was happy with the lesson but felt it could be improved. So I tried it with a different class. With this group, I told them their robots needed to have moving parts. I also told them I didn’t know how to do this so we needed to discover this together. This class worked on finding and printing some different kinds of joints. For example, we found a ball and socket joint on Thingiverse (Thingiverse is a place where you can find uploaded .stl files you can download and print for free) and we printed it and analyzed it. In the end we downloaded and printed several parts from Thingiverse to investigate how to design these things. The robots in this class were much more interesting and incorporated more math and engineering concepts. It would have been ideal if each student had printed a sample joint, but with 80 kids and 2 printers, there just wasn’t time. About half of the robots’ joints worked. Many of the students ended up gluing their parts together in the end. It was sensational! The student all wrote a reflection about the process, what went wrong, what worked and what they would do differently. After reading their reflections, it was clear that the students learned a great deal. I talked frequently about how engineers and inventors have many failures before they are successful. Learning from mistakes is a powerful procedure. My next 3D lesson is going to be a group project. Stay tuned! 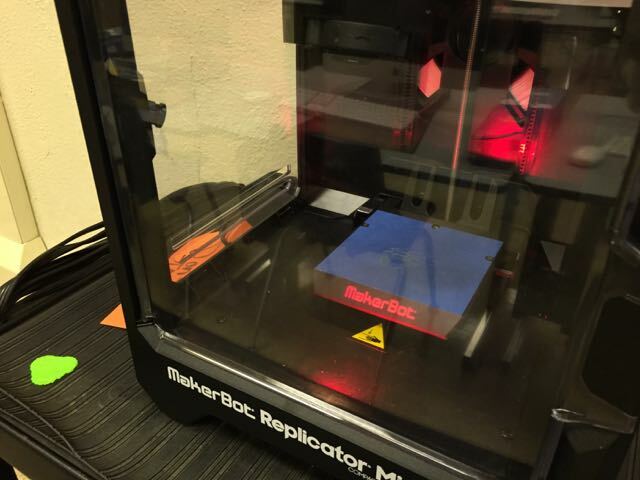 Our Design Lab at my school (what we call our MakerSpace) had a 3D printer for a while, a MakerBot Cupcake CNC. It was pretty good while it lasted; but as it was built from a kit, and the software isn’t really supported any more, and there are some serious challenges with how the machine performed in the last few weeks of its life, it’s sort of retired now. One of my challenges with the work was exactly what you tried to overcome through the use of predesigned parts from Thingaverse, which is that complex parts like ball-socket joints, or the many moving parts of a tank tread, are often beyond the design skill of, say, fourth graders. As a result, our 3D printer spent a lot of time producing what amounted to blocks — single objects that didn’t connect to other objects, and weren’t parts that snapped together to form something larger. It’s part of the reason why I’ve gone to a parts-oriented model in the Design Lab, where we have bins of pre-made parts to build something larger out of them. That said, I want to get a new 3D printer sooner or later. There are three basic forms of manufacturing, more or less: Jobbing, which is what we might call parts-creation: a factory or a series of machines that run raw metal through a series of process that turn them into nails, or screws or washers — that is, parts Most jobbing work consists of subtractive operations: stripping away material from a raw block of something, carving, drilling, sawing, milling, sanding and so on. And then there’s Assembly, which is putting parts together to form a larger machine. And finally there’s this new process… additive operations, or 3D printing, where you take raw materials and add them very precisely in order to create a part. This is really quite new in manufacturing, and it’s changing the way whole industries think. So I think that any MakerSpace should really have the ability to do all these things (jobbing through various subtractive arrangements; assembly of parts; and additive operations) in both rigid materials like wood and metal and plastic; and ‘floppy materials’ like paper and fabric. Because otherwise kids don’t really learn how things are made… and neither do we as their teachers.